This tangy recipe is great served over rice and with stir-fried veggies. Enjoy! To make meatballs: Combine all ingredients in a bowl and mix well. 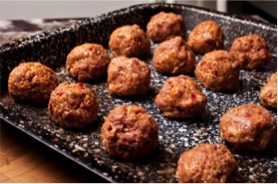 Roll into 1″ balls and place on a broiler pan and broil for 10-15 minutes, turning occasionally. To make pineapple sauce: Combine all ingredients except green pepper in a pot and stir well. Cook over low heat stirring constantly until smooth and thick. Add green pepper. Pour sauce over prepared meatballs and simmer for a few minutes. Alternatively put in the oven in a casserole dish and bake at 350F for 30 minutes.